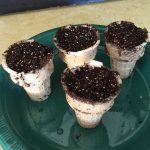 Do you throw away your cyclamen plants at the end of their bloom cycle? Dropped flowers and yellowing foliage make them look as though they are dying, but they are really just entering a dormant period. Find out how to get cyclamen to bloom again in this article. Cyclamen is a Mediterranean plant. Summers in Mediterranean regions are difficult for some plants to bear because of the intense sunlight and little or no rain. Some Mediterranean plants, such as cyclamen, enter a dormant period during summer. They drop their leaves and flowers, and rest until late summer or early autumn. You can help them through their resting phase by providing ideal conditions for their summer nap. Getting blooms on cyclamen plants isn’t difficult, but you have to give the plant a summer rest followed by the proper conditions to bloom again. Follow these instructions for beautiful results every year. In late spring, the leaves on a cyclamen plant begin to turn yellow. This is a signal that it is ready to rest. Stop fertilizing the plant, and gradually give it less and less water. Once all of the leaves are yellow, you can quit watering altogether. The tuber absorbs energy from the yellowing leaves, so leave them alone until they are completely dry. Place the pot in the coolest room in your home for a summer rest. During this time, the plant won’t need much sunlight, so choose the resting site by temperature rather than light conditions. You won’t need to water it regularly, but check the tuber now and then to make sure it isn’t beginning to shrivel. Give it just enough water to keep it firm and smooth. 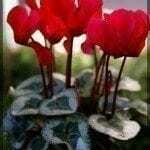 In late August or early September, your cyclamen will begin putting on fresh foliage. Water the plant thoroughly, pouring out any water that collects in the saucer. Water again every time the upper inch of the soil becomes dry. Add a liquid houseplant fertilizer for flowering plants monthly, mixing it according to the package instructions. Set the plant in a south-, east- or west-facing window, and you’ll soon have a new flush of cyclamen flowers. Now that your cyclamens are blooming again, you’ll want to keep them in bloom as long as possible. Two essential ingredients are cool night temperatures and frequent deadheading. Cyclamens thrive in cool temperatures, and they like night temperatures as cool as 40 degrees Fahrenheit (4 C.). Despite the best care, cyclamen flowers eventually fade. As soon as they are no longer perky and attractive, cut them off near the base of the plant. This keeps faded flowers from becoming a drain on the plant’s energy. Next time you find that your cyclamen plants are not blooming, it might be that all they need is a nap.